August 3, 2011 – The St. Thomas Times-Journal (SunMedia/Canoe) today ran a large and well-researched story today about the release, yesterday, of Freedom Party of Ontario’s “Separating Public Schools and Organized Religious Practice” plank. Writer Nick Lypaczewski sought comments about the plank from the Progressive Conservative candidate running against Freedom Party leader Paul McKeever in the riding of Elgin-Middlesex-London, and spoke to a superintendent of education with the Greater Essex County District School Board about its “pilot” project to teach public school children in Arabic. Click here to read the article. Don’t forget to share it with your friends and acquaintances. And be sure to send a brief (3 to 5 sentence) letter to the Editor, expressing your views about the story, and the issue. 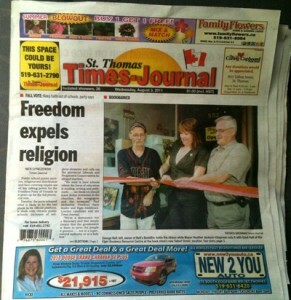 You can submit your letter to the editor of the St. Thomas Time-Journal here.